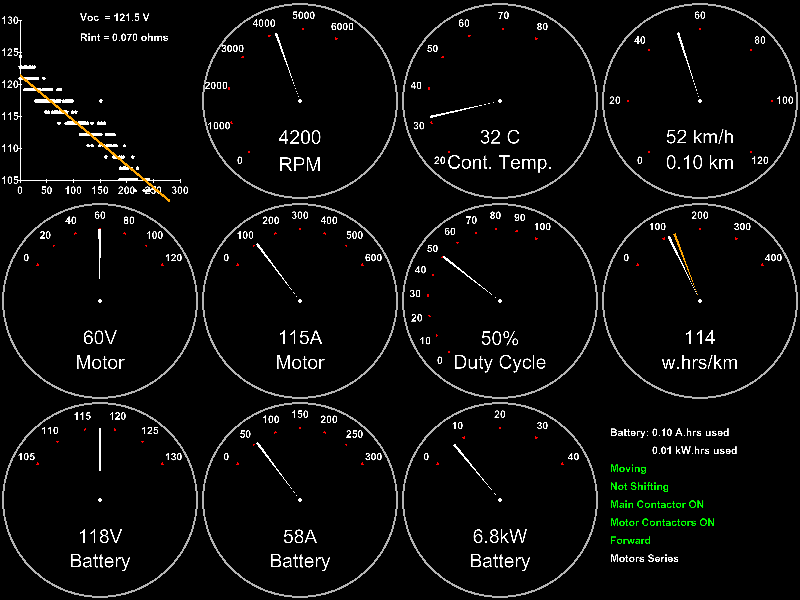 ZillaView is a simple Windows OpenGL program for the display of serial output data from the Zilla motor controllers. It makes real-time interpretation of the Zilla serial data stream intuitive (easier than reading a hex stream in your serial terminal at least! ), while also logging the original data stream to file for post-trip analysis. The original version was written when I received my Zilla controller, to assist in performance evaluation and trouble-shooting of our EV, and with the idea of one day developing it into a "glass dashboard". Fast forward a couple years, and with the encouragement of some members of the EVDL, who I had previously sent the original version to, I have added a few customization features and made it publically available to interested Zilla users. BTW, if you're a hardware guru working on a BMS, and interested in partnering your battery/cell data output with ZillaView or something similar, please drop me an email. Copyright (c) 2008 evgear.com.au. All rights reserved.